It’s late July and there are wisps of clouds scattered in the muddy sky. Whether the clouds will usher the much-awaited rains doesn’t bother Korale Raghu, a middle-aged farmer of Hondure village in Sira administrative block, 70 km from Tumakuru and an hour-and-half car ride from the southern city of Bengaluru in Karnataka. Belonging to a family of farmers that for generations has been growing rice and maize relying on the monsoon rains, Raghu, like several others in this drought-prone district, has over the years shifted to growing millet, freeing themselves from the vagaries of weather. With continuous drought for three years, the farmers have abandoned irrigation-intensive crops like rice, sugarcane or maize in favour of millet, a drought-resistant crop. 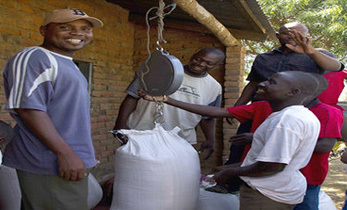 A village with a population of 2,000, most farmers in Hondure grow Korale (brown top millet). 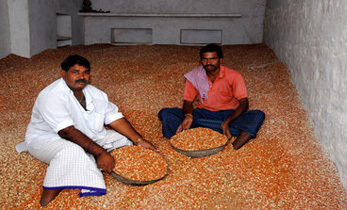 Following workshops held at farm doors and millet-themed fairs organised by Sahaja Samruddha, an NGO working among agriculturists in Karnataka’s five arid districts, farmers like Raghu took to growing it and presently grow brown top millets on 10 acres besides growing rice and wheat. 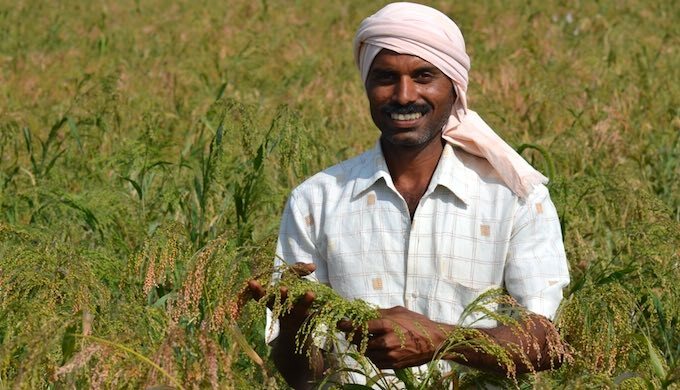 “We could not think beyond the irrigated crops like paddy and sugarcane, which left us at the mercy of either scanty rains or drought, [these weather changes] made us go for millet,” Raghu, who began cultivating millet in 2011 on eight and a half acres, adding more in subsequent years, told indiaclimatedialogue.net. He harvests a yield ranging between 70 to 80 quintals (a quintal is 100 kilogrammes) and retails his produce through a network of housewives, besides selling seeds to farmers. 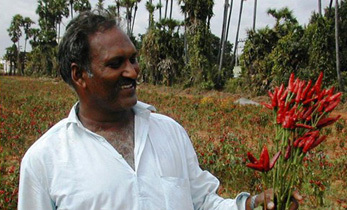 Raghu has been instrumental in reviving brown top millets and popularising it among farmers in Karnataka, which till now was restricted to pockets of Ananthpur in neighbouring Andhra Pradesh. This has earned him the sobriquet ‘Korale’, the local name of the brown top millet. The revival of millet cultivation in the southern provinces of Karnataka, Andhra Pradesh and Telengana, agronomics say, is a step towards sustainable cropping practices that respects biodiversity in nature. There are many factors that make millets more sustainable as crops. This is exemplified by comparing the amount of water needed to grow rice with that for millets. One rice plant requires nearly 2.5 times the amount of water required by a single millet plant of most varieties, according to the Crops Research Institute for the Semi-Arid Tropics (ICRISAT), a global research organisation helping to make millets more popular. Farmers in northern and southern Karnataka used to grow the little millet during the Kharif (April to October) season as a mixed crop along with groundnut and other crops and they were consumed on a daily basis in Haveri, Dharwad, Gadag, Bagalkot, etc. Elderly farmers remember that millet was once the staple food in the Mandya, Dharwad and Tumakuru regions, but was replaced due to the invasion of rice and wheat in the last three to four decades. As it acquired the tag of being poor man’s food, farmers stopped growing it while the government’s Public Distribution System, which provides cheap grains to the poor, played a key role in pushing nutritionally rich millet away from the plate. With the second-largest area of dry land in the country after Rajasthan, Karnataka has the highest proportion of drought-prone area among all major states in the country. The land resources of Karnataka, especially its dry, drought-prone lands that comprise more than 79% of the total arable area, have been poorly managed by resource-poor farmers. The total irrigation potential from all sources, including inter-basin transfers, is estimated at around 50% of the total cropped area of 10.5 million hectares by the Karnataka state land use. A crop that can grow in areas with less than 350 mm of rainfall and the cultivation cycle completed within 70-100 days has resulted in farmers in dry regions of Chitradurga, Dharwad, Tumakuru, Chamraj Nagar, Mandya and Raichur witnessing a millet revival with farmlands in these districts being wooded by the small millet family, which includes Foxtail Millet, Brown Top Millet, Little Millet, Kodo Millet, Barnyard Millet and Finger Millet. These areas receive rainfall between 600 mm to 900 mm, while the Karnataka average is 1,248 mm, and with temperatures varying from 45 degrees Celsius in the summer to 10-15 degrees in winter. Of these, Barnyard Millet is the fastest growing, producing a crop in six weeks and offering 10 times more fibre than wheat. 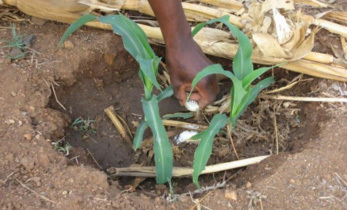 Koralu is drought-resistant and can be cultivated in any kinds of soil, while Kodo Millet, also drought-resistant, is an ideal crop for fallow and infertile lands with pebbles. Its straw is used as thatch for roof and preparing mudde (balls) to preserve seeds. India’s semi-arid regions have expanded by 10% in recent decades, which includes swathes of Rajasthan, Gujarat, Maharashtra, Karnataka, Andhra Pradesh and Tamil Nadu, making the inhabitants most vulnerable to climate change. In addition to its impacts, rural India is witnessing growing agrarian distress despite bountiful harvests. There will be a huge deficit, about 13.91 million tonnes, of rice in 2030 in a situation of 20% rainfall deficit and a deficit of 28.66 million tonnes, if the rainfall deficit is 30%, according to study published in Economic and Political Weekly magazine, titled Projected Effect of Droughts on Supply, Demand, and Prices of Crops in India. The authors stress that to meet demand, a high level of import will be necessary, which will lead to a spike in the prices of rice and other complementary commodities in the global market, further fuelling price rise. 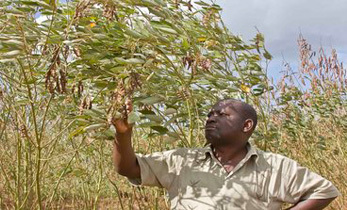 Increasingly erratic rainfall patterns and crop losses due to climate change factors has forced farmers who were following to conventional agriculture to return to sorghum, little millet and foxtail millet cultivation, having realised that this crop is much more resilient to environmental stress, gives an assured yield in both low and excess rainfall conditions, while keeping input costs low. In the present agricultural scenario, millet farmers can be considered as followers of sustainable farming practices holding lessons for building climate resilience or the ability to adapt to change, overcome constraints, reduce disruptions and enhance opportunities. Like Sunil Kundgol of Itigatti village, 2 km from Dharwad town, who grows six varieties of millet having shifted from Bt cotton, soybean and maize in 2014, and one who strongly believes that millet is truly a shri dhanya (superior grain) and not nikristha dhanya (inferior grain) as it has been known in recent years. 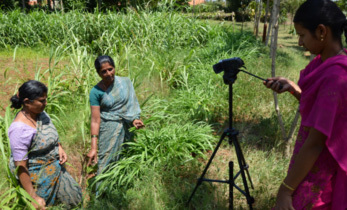 A member of a farmers’ collective, Sanjivini Savayava Krushikara Balaga, which has around 80 farmers under its wings, Kundgol says that the collective runs a seed bank too. “Here farmers are offered seeds complimentary with the promise that they return double the volume once the crop is harvested,” Kundgol told indiaclimatedialogue.net, adding that a soon-to-be-functional mill at Timmapur on Hubli-Haveri highway is likely to come as a boon to millet growers of Dharwad district. With advantages loaded in its favour such as low-maintenance, disease and pest resistance, nutritional benefits, market demand, fodder value and ecological benefits, millet is being considered as a smart crop. Known as C4 crops, millets have higher efficiency in absorbing and utilizing carbon dioxide. 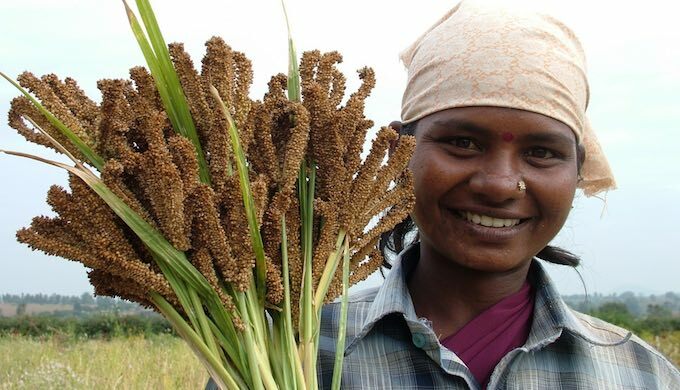 Most varieties of millets are well known for their hardiness and have the capacity to withstand prolonged periods of drought, high temperatures and still produce grains and fodder. In India, millets are grown on about 15 million hectares, with an annual production of 17 million tonnes and contribute 10% to the country’s food grain basket. Karnataka is on a millet-popularising drive focused on the nutritive value of the grain and has initiated far-reaching measures to claim the title of being the millet capital of the country. The state government, in association with Hyderabad-based International Crops Research Institute for the Semi-Arid Tropics (ICRISAT), and agricultural universities in Bengaluru, Dharwad and Raichur, has developed drought-resistant high-yielding varieties of millets. In 2016, the state became the first in the country to offer 10 kg of sorghum and finger millet each to families living below the poverty line, giving a boost to not only to millet cultivation, but also ensuring nutritional security among the deprived.